The floor of the Jenny Craig Pavilion has seen some intense competition. On Tuesday evenings in the Warren Room, a surprisingly charming rectangle of space a few flights of stairs up, the JCP sees some intense contemplation. 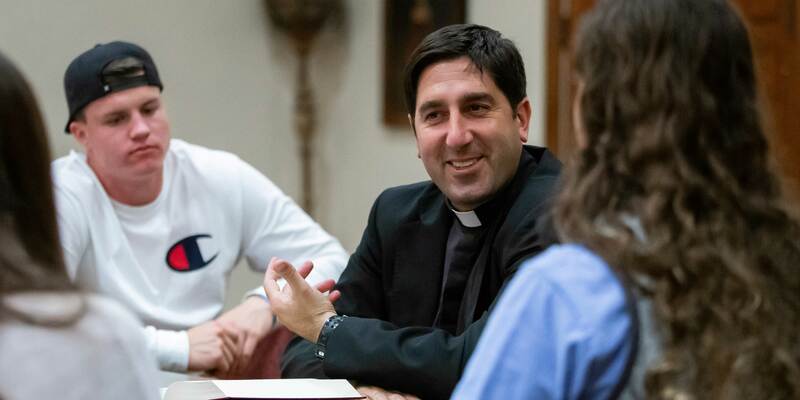 The Torero Athletic Fellowship, headed by Father Martin Latiff, creates opportunities for reflection and spiritual exploration to students who combine the rigors of USD classrooms and labs with the demands of Division I collegiate athletics. It’s an informal group; on any given Tuesday, some of the couple dozen athletes involved in the program — representing most every sport — get together for conversation and fellowship. On one Tuesday, the Domino’s boxes and water bottles that cluttered a round table were joined by a box of doughnuts in celebration of Father Martin’s 42nd birthday. Nine athletes, who would later perform a wonderfully off-key version of “Happy Birthday,” chatted and laughed as they found seats. Father Latiff looks the part of a spiritual leader for athletes, if a self-deprecating one. “This is the closest I’ll get to competition,” he says. But in fact, as his square shoulders and firm handshake suggest, this priest knows quite a lot about athletic competition. In another era of his life, he competed on rugby and soccer teams and developed a love of tennis. He’s also an avid hiker and rock climber, where the competition is the natural world — and oneself. For years, the late Father Owen Mullen was pastor to the athletes, going on road trips, leading the team in pre- and postgame prayers, and serving as the spiritual team captain. Father Martin seemed a natural choice to assume the duties of Torero team chaplain when Father Mullen’s health began to decline. Originally, he called his informal meetings Pizza with Padre, but that smacked more of Petco Park than Alcalá Park. The Torero Athletic Fellowship was born. The meetings typically feature a reading from the Gospel and a reflection by Father Martin, but he’s quick to point out that meetings are participatory. Most every USD student needs some giddyup! to meet the academic demands of a top-flight university. For student-athletes, the challenge is steeper. The former rock climber gets that. “Student-athletes have very little free time and need to devote more attention to setting priorities than most other students,” Father Martin says. At USD, they don’t get the winks and the nods that contemporaries at other universities sometimes do. Father Martin points out Athletic Director Bill McGillis actually prefers the term “scholar-athlete” to describe their USD experience. “It may seem a subtle difference, but it’s an important one,” says Father Martin. Hailey Purtzer is a junior majoring in behavioral neuroscience. She also runs on the cross-country team and works an on-campus job as social change corps co-chair at the Changemaker Hub. Time is a precious commodity, but Purtzer makes an effort to attend the Tuesday night fellowship. Whether he’s with the scholar-athletes in the private inner-sanctum of the locker room, supporting them in the public, no-excuses spotlight of stadia and arenas, or beside them on long walks, Father Martin is as much a Torero as any setter or goalie, midfielder, linebacker or outfielder.